Blessed - or cursed - with the ethereal beauty that typifies the otherworldly roles that she frequently plays, Saffron Burrows is one of the most striking actresses working today. She was born on 22 October 1972 to very left-wing parents, and from an early age was selling the Socialist Worker and living with striking miners. However, at fifteen she was scouted as a model, switching to acting soon afterwards. She made her debut in a small role in the Guildford Four drama In The Name Of The Father (Ireland/UK, d. Jim Sheridan, 1993). A more substantial, albeit two-dimensional, role came as the impossibly glamorous temptress Nan Mahon in Circle Of Friends (Ireland/US/UK, d. Pat O'Connor, 1995). She appeared in Dennis Potter's final TV dramas Karaoke and Cold Lazarus (BBC, 1996), although her characterisation, as the obligatory femme fatale, was essentially defined by her stunning appearance. 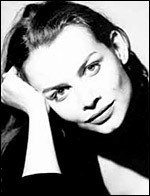 A cameo, typecast as a supermodel, in One Night Stand (US, 1997) brought her to the attention of director Mike Figgis , with whom she collaborated on a variety of esoteric and experimental projects, including The Loss of Sexual Innocence (US/UK, 1999), his low-key adaptation of Strindberg's Miss Julie (US/UK, 1999) and his multiple-camera films Timecode (US, 2000) and Hotel (UK/Italy, 2001). She also made more mainstream fare, notably the sublimely ridiculous shark thriller Deep Blue Sea (US, 1999), and was fired from Woody Allen's film Celebrity (US, 1998) with the backhanded compliment that she was 'not vulgar enough'. More typical projects included her glamorous yet sad performance as a gangster's moll in Gangster No. 1 (UK/Germany/Ireland, d. Paul McGuigan, 2000) and arguably a career-best appearance as the beguiling and mysterious double agent in the WWII spy thriller Enigma (UK/US/Germany/Netherlands, d. Michael Apted, 2001). She had a brief cameo in Julie Taymor's excellent Frida Kahlo biopic Frida (US/Canada/Mexico, 2002), and, perhaps surprisingly, was not cast as Helen of Troy in the Homer pastiche Troy (US/Malta/UK, d. Wolfgang Petersen, 2004), apparently on the grounds that she was 'too recognisable'; instead, she appeared as Andromache, Hector's devoted wife. Her interests have increasingly seen her move away from film to theatre and politics, which, coupled with her unapologetic bisexuality, have gradually removed her from the mainstream, although her appearances in such films as the artist biopic Klimt (Austria/Germany/UK/France, 2006), in which she played his muse Ines de Castro, indicate her continuing willingness to take risks.